What is the average size for a deck? What is the average size of a deck? We get asked this quite often and this question raises more questions. If you define “average” by the deck most people get when they buy a home, you would get an answer of somewhere between a 10′ x 12′ and 12′ x 16′ as these are the most popular sizes that builders include on houses with crawl spaces. Most decks are actually enlarged or built after a homeowner takes occupancy to fit their needs. This is where the appropriate questions come in. How many people will typically occupy the deck on any given weekend? How many people live in the house? 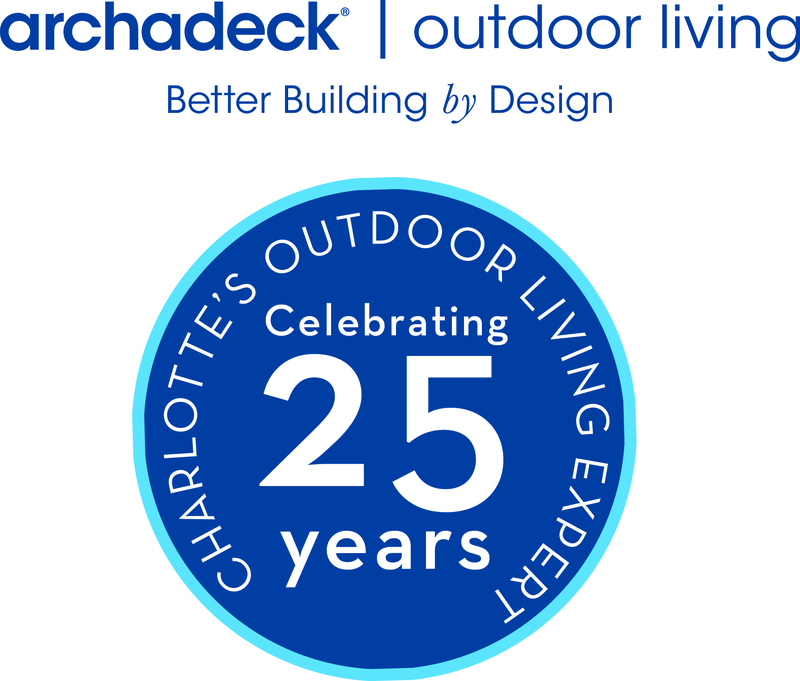 What are your outdoor living lifestyle preferences? What other amenities will there need to be space for on your deck? Will you place a grill, a hot tub, a water feature, a fire feature? What about outdoor furniture? Will you plan on eating meals and therefore need to consider the shape and size of your table? Small ideas that have a large impact on your deck! What are some things you can do to make your deck just a little bit nicer than your neighbors? What makes your home unique either aesthetically or functionally? This blog is about ideas that are simple that can vastly improve your deck! Starting with aesthetics, sometimes it’s nothing more than just clipping the corners to create more character and give the deck a more interesting shape. From there, the direction in which you have the deck boards installed can improve the appearance. Whether it is on a diagonal or possibly a herringbone design. A nice touch is to create a picture frame look by running a couple of deck boards a different direction following the perimeter of the deck. This will require some blocking in between the floor joists. Railing options are plentiful. You can consider metal rail as an option or simply metal pickets that come in a variety of colors and styles. Finally, color makes a big difference. If you are selecting a composite you want to make sure it’s a color that compliments your house colors. 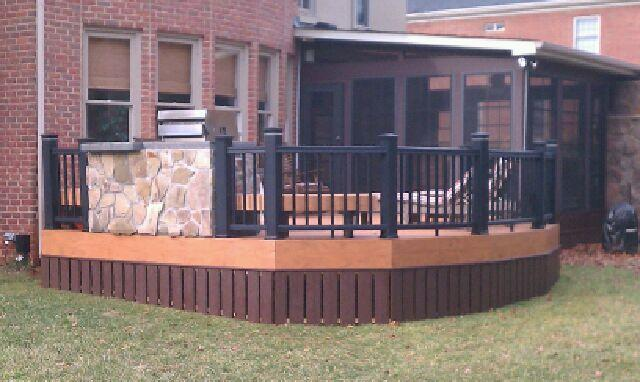 Many times,we combine 2 different colors like making a border a complimentary color to the deck board or rail. Functional considerations include step placement and width. The higher off the ground your deck is, you probably do not want real wide steps because they chew up a lot of your yard. The lower decks it is a nice touch to have wide steps, flared steps, or octagonal steps. 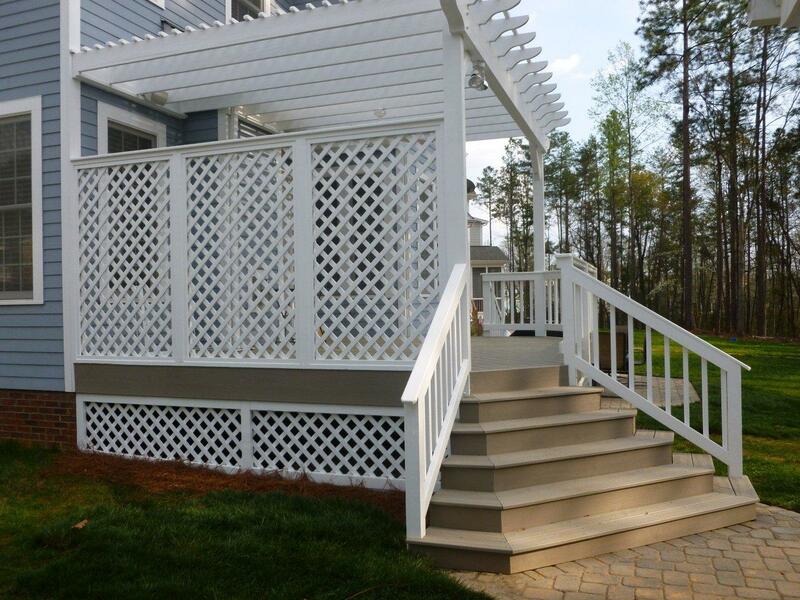 By placing the stairway to one corner of the deck keeps the rest of the deck available for furniture placement. Lower decks also do not require rail in North or South Carolina as long as the rail is less than 30″ off grade. It can look nice using rail as an accent without going all the way around the low deck. We find multi-level decks add great aesthetic appeal but are not as functional unless you make each level large enough to accommodate either furniture or a grill or a whatever your thought is for utility of the space. This is an important consideration in deck design.